Deflated Dimensions: 45" X 29" X 21"
Seated Height of Slide: 5'6"
A level clean area of grass approx. 23'w x25'd with no overhead obstructions such as power lines or trees. 20 amp electrical power outlet or 5000 watt or larger generator. 12 guage extention cord max. 50'. Vehicle Requirements:This unit will fit in most SUV, Mini Van or Pickup Truck. Rear seat may need to be removed before loading into your vehicle. Will not load in any cars/car trunk. Our Bounce Houses comes in a vinyl bag. Adult supervision is always recommended on any of our games and inflatable’s. We recommend 2 adults to load, unload and take down the bounce house. Our bounce house combo systems include exciting jumping areas and fun slide exits, perfect for providing an extra level of activity and adventure. Bounce house combo's are a great entertainment source for all kinds of events. If you are looking for a bounce house for a party or one for a family event, the kids will be having so much fun, the parents can enjoy their event without having to worry about the kids being bored. Whether a child is seeking exhilarating fun or the child at heart wishes to have a blast, getting one of these is sure to create fun for a lifetime. To have a bounce house allows children to burn off energy as well as having as much fun as they can, to their hearts content. When these inflatables are constructed, safety is a main feature in building them. 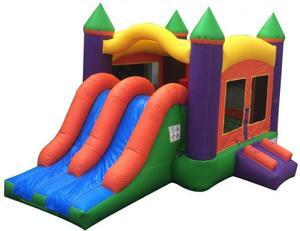 Bounce house combo's today meet as incredible amount of standards, therefore, each and every one is checked for, safety issues, and building construction for the safety of the customers and their children.